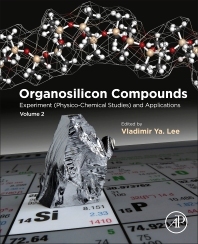 Organosilicon Compounds: Experiment (Physico-Chemical Studies) and Applications, volume 2, also contains two parts. In its first part, Experiment (Physico-Chemical Studies), the application of modern instrumental tools (such as X-ray crystallography, 29Si NMR spectroscopy, UV-Photoelectron Spectroscopy, and other methods) for assessing the structures of organosilicon compounds is described. The second part, Applications, reviews the current research in the field of material science, specifically the use of organosilicon compounds in synthetic chemistry directed towards the creation of new materials. Organosilicon Compounds: From Theory to Synthesis to Applications provides a comprehensive overview of this important area of organic and organometallic chemistry, dealing with compounds containing carbon–silicon bonds. This field, which includes compounds that are widely encountered in commercial products such as in the fabrication of sealants, adhesives, and coatings, has seen many milestone discoveries reported during the last two decades. Beginning with the theoretical aspects of organosilicon compounds’ structure and bonding, the book then explores their synthetic aspects, including main group element organosilicon compounds, transition metal complexes, silicon cages and clusters, low-coordinate organosilicon derivatives (cations, radicals, anions, multiple bonds to silicon, silaaromatics), and more. Next, readers will find valuable sections that explore physical and chemical properties of organosilicon compounds by means of X-ray crystallography, 29Si NMR spectroscopy, photoelectron spectroscopy, and other methods. Finally, the work delves into applications for industrial uses and in many related fields, such as polymers, material science, nanotechnology, bioorganics, and medicinal silicon chemistry.